PCN Network – What is a Private Cellular Network (PCN)? The Private Cellular network is the most resilient cellular network available for small to medium sized businesses. Why? Because it’s a cellular network that is not shared with thousands of other users so you get the best quality voice and highest bandwidth available. The Private Cellular Network is the only cellular offload product available that doesn’t require WiFi or Smartphone Apps to make and recieve calls. The Private Cellular Network is for TruConverged or TruMobile customers. When a TruMobility devices enters the office, the phone is automatically connects to the PCN. 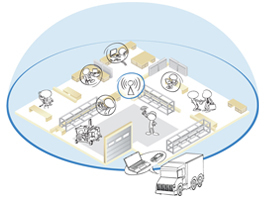 Large physical spaces or locations with a high number of Mobile Users – the Private Cellular Network can be clustered to accommodate millions of square feet or hundred of users. This is perfect for large campuses, manufacturing facilities, or construction areas.